"Edmodo has been invaluable in promoting digital citizenship for my students, and an awareness of appropriate, but exciting online participation." Educators, students and parents around the world continue to log on and learn in these digital times. But how does the largest K - 12 social learning platform transform into a global conduit for meaningful learning and promote responsible digital citizenship? This month at EdmodoCon, the world's largest online conference about education, more than 25,000 teachers and administrators from 170 countries experienced the enhanced version of the web-based learning platform's latest iPad App (currently No. 1 on iTunes Education and No. 2 in Google Play) and shared different ways in which they are currently using digital tools in their classrooms. 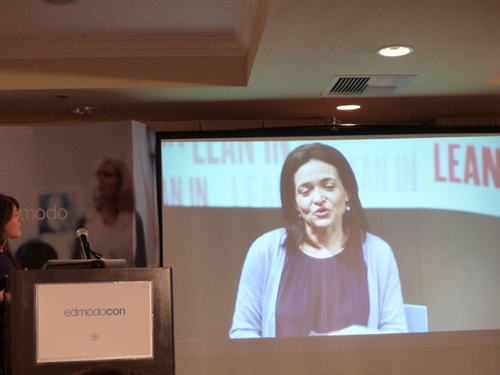 Edmodo already has an impressive 22 million users worldwide. "When we created Edmodo, we envisioned a tool to streamline learning, putting the teacher at the center and delivering resources in one place," explains Crystal Hutter, Edmodo CEO. "As we continue to develop our network, we look to further enhance the ways in which teachers, students, administrators, parents and developers communicate." So, what are some of the specific ways in which educators around the world are using these digital tools? I asked Viviene Tuckerman from Australia (Grade 1 to 11, Portland Central School, New South Wales), Kim McMonagle from the United States (Douglas County School District, Colorado), Bijal Damani from India (The Galaxy Education System, Rajkot Area), Ana Maria Menezes from Brazil (Cultura Inglesa, Uberlandia), and Charlotte Neumann from Sweden (Falkenbergs gymnasieskola, years 10 - 13 and adult education) to share their experiences. Viviene Tuckerman in Australia - The most exciting thing I find about using Edmodo is its potential to connect my classes with others from both within my country and with those overseas. I have participated in global classroom groups with classes and teachers from the U.S., China, Vietnam and New Zealand. We have used small groups for different activities (polls and discussion, cultural Q&As), and within these groups, we share and comment as an authentic audience. Edmodo has really broken down the global wall for my small, rural school, and allowed my students a real connection with other cultures and other schools. I make a lot of use of small groups in my private classes to differentiate projects and activities for my students. We are able to give each other positive feedback and criticism as well. Edmodo has been invaluable in promoting digital citizenship for my students, and an awareness of appropriate, but exciting online participation. Naturally, the quiz and assignment features, the backpack, and the ability to showcase student work for all the class to see are wonderful features of Edmodo too. I love how groups can be archived and work brought out for later perusal if necessary, and how students can have quick access to work I post from home, and can participate while out of class. "Edmodo helps students with special needs to gain confidence and independence by giving the special needs teachers and student helpers a way to monitor and support students without having to always be present in the classroom with us." Kim McMonagle in Colorado - As Douglas County School District Director of Education Technology, we have several areas in which Edmodo is transforming teaching and learning. For the last couple of years, our leadership team has collaborated in an Edmodo group during district meetings. This has quickly transferred to creating school level professional learning Edmodo communities and most importantly directly to collaborative learning opportunities for students. Edmodo is quickly becoming the premier social learning space for school leaders, educators and learners to connect, create, and reflect. In the classroom, learners are accessing information through media-rich visual content prior to class. In posts, they reflect, ask questions, ponder possibilities and support peers with additional resources. As learners create their understanding of content, the posts become a reflection area to provide meaningful feedback, discussions and provocative debates. With the addition of Edmodo "Discover," it's easier than ever for an educator to curate engaging content to support differentiated learning. Edmodo is authentic learning at its best. Bijal Damani in India - Project Galaxy Bazaar is a social entrepreneurship project that started in 2005 with 28 students and dual objectives. First, to give students the entrepreneurial skills in real life situations; and second, to bridge the social and opportunity gap in the community. Every year, students from grades 11-12 set up a bazaar before the Diwali festival, selling all the festive related goodies at a reasonable price under one roof. In the project's first year, the students raised a net profit of INR 8000 (approximately $160). The number of students rose to 160 in 2012. With the increase in participation, I use Edmodo to help me in coordination and communication. I have been using Edmodo for the past two years and I can easily add scalability to Project Galaxy Bazaar. Interacting with groups and individuals by holding meetings online have made my job much simpler and more effective. One very good feature of Edmodo is that it makes student-centric decisions possible by polling about any issue. Not to mention, we managed to post net profits of INR 68,000 (approximately $13,600) in 2012, which is used to provide equal educational opportunity to girls from underprivileged sections of the community. 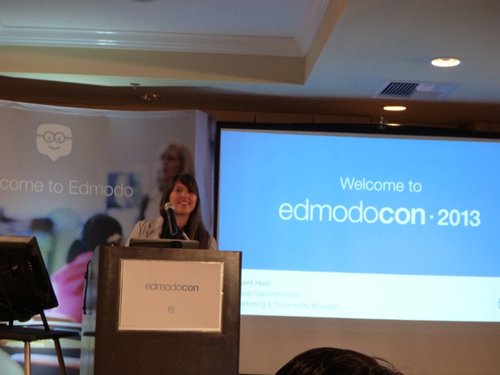 Ana Maria Menezes in Brazil - I teach English to teenagers in Brazil, and Edmodo has been a valuable asset to learning. As we only have English classes twice a week, using Edmodo with students has been a way to further expose the learners to the language. Many times we may believe beginner students can't write in English, which in fact is a misconception. I normally alternate traditional homework with writings in Edmodo. Each week, I write an example text about myself using language learned that week, and for homework, I ask students to send a message to the whole group with a similar text about themselves, adding their own photos as attachments when appropriate. The benefits I've noticed is that they have the chance to express themselves in English from the start and also learn a lot about each other by contributing to a good atmosphere in the classroom. 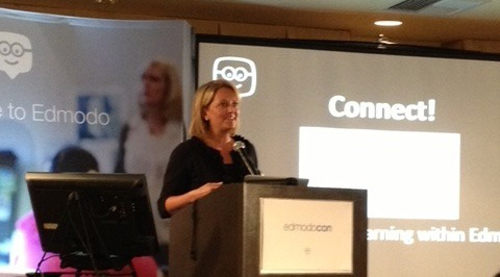 Charlotte Neumann in Sweden - Edmodo is the nave of all the learning going on. As I'm teaching two languages and language arts (EFL intermediate and advanced levels and Swedish), and work closely together with the Social Science and History teacher, there is a lot of diverse resources to coordinate. What would literature mean without the historical context? What better use of language is there but changing the society you live in? Our school is inclusive in every way. Edmodo helps students with special needs to gain confidence and independence by giving the special needs teachers and student helpers a way to monitor and support students without having to always be present in the classroom with us. With Edmodo we're able to further develop peer assessment over class and year boundaries. Students can cooperate and discuss their work even if their timetables aren't synched, which is great in a school with 1400 students. In The Global Search for Education, join me and globally renowned thought leaders including Sir Michael Barber (UK), Dr. Michael Block (U.S.), Dr. Leon Botstein (U.S.), Professor Clay Christensen (U.S.), Dr. Linda Darling-Hammond (U.S.), Dr. Madhav Chavan (India), Professor Michael Fullan (Canada), Professor Howard Gardner (U.S.), Professor Andy Hargreaves (U.S.), Professor Yvonne Hellman (The Netherlands), Professor Kristin Helstad (Norway), Jean Hendrickson (U.S.), Professor Rose Hipkins (New Zealand), Professor Cornelia Hoogland (Canada), Honourable Jeff Johnson (Canada), Mme. Chantal Kaufmann (Belgium), Dr. Eija Kauppinen (Finland), State Secretary Tapio Kosunen (Finland), Professor Dominique Lafontaine (Belgium), Professor Hugh Lauder (UK), Professor Ben Levin (Canada), Lord Ken Macdonald (UK), Professor Barry McGaw (Australia), Shiv Nadar (India), Professor R. Natarajan (India), Dr. Pak Tee Ng (Singapore), Dr. Denise Pope (US), Sridhar Rajagopalan (India), Dr. Diane Ravitch (U.S.), Richard Wilson Riley (U.S.), Sir Ken Robinson (UK), Professor Pasi Sahlberg (Finland), Andreas Schleicher (PISA, OECD), Dr. Anthony Seldon (UK), Dr. David Shaffer (U.S.), Dr. Kirsten Sivesind (Norway), Chancellor Stephen Spahn (U.S.), Yves Theze (Lycee Francais U.S.), Professor Charles Ungerleider (Canada), Professor Tony Wagner (U.S.), Sir David Watson (UK), Professor Dylan Wiliam (UK), Dr. Mark Wormald (UK), Professor Theo Wubbels (The Netherlands), Professor Michael Young (UK), and Professor Minxuan Zhang (China) as they explore the big picture education questions that all nations face today.